"My family prefers the store brand of Italian dressing to any of the name brands. They all pretty much taste the same and have the same ingredients. 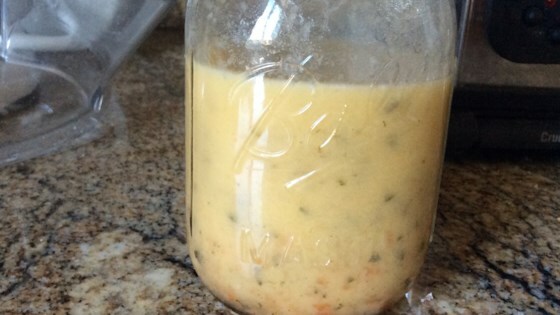 This is a copycat of their dressing using mostly ingredients from the cabinet most people keep on hand or can find easily. The water makes it stretch a little further for those on a tight budget, but you might also like it without." Set oven rack about 6 inches from the heat source and preheat the oven's broiler. Line a baking sheet with aluminum foil and add red bell pepper. Roast red bell pepper under the broiler until slightly blackened, about 12 minutes. Transfer bell pepper to a bowl and cover tightly with plastic wrap for about 10 minutes. Carefully remove plastic wrap and peel skin from bell pepper. Blend roasted red pepper, oil, water, vinegar, sugar, basil, lemon juice, minced onion, and salt in a blender until smooth. An easy corn salad with roasted red peppers and a creamy dressing. Store in the refrigerator overnight for best taste, although usable immediately if needed. Shake well before using. I used red wine vinegar and home dried tomatoes instead of bell peppers. I also added some minced garlic. Then instead of all basil, I added half basil and half oregano. I loved this dressing because it had fresh lemon juice in it. It also tells how to roast the red peppers, so helpful. thank you.